Location of Commerce Township within Oakland County, Michigan. 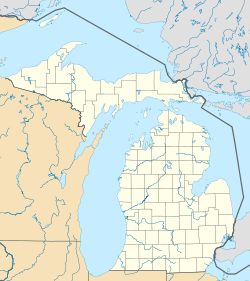 Commerce Charter Township is a charter township of Oakland County, in the U.S. state of Michigan. The population was 34,764 at the 2000 census. The terrain is rolling hills but there are large expanses of flat land on which farms and, more recently, subdivisions are built. The Huron River runs mostly north-south through the township. Commerce was formerly a weekend and summer resort for Detroiters because of the area's small inland lakes and peaceful seclusion, but due to recent development the cottages are now all permanent homes. There has been a sharp increase in population in the last few years, mostly on or near the several lakes and golf courses. Much of Proud Lake State Recreation Area is within the township. The northern terminus of M-5 is in Commerce. The busy highway would have continued north to I-75, but because of the area's high property value and the many lakes that dot the landscape such a project would have been far too costly. Commerce Township shares borders with West Bloomfield, White Lake, Milford Township, Walled Lake, Wolverine Lake, Novi, and Wixom. In 1994, David Hahn, a 17-year old Eagle Scout, constructed a makeshift nuclear reactor in his backyard in Commerce Township, exposing himself and his neighbors-and maybe even as many as 40,000 people in the area-to radioactive materials and drawing the attention of the EPA. The event became a short-lived media sensation, and a book by Ken Silverstein called The Radioactive Boy Scout was written about the incident and published in 2004. According to the United States Census Bureau, the township has a total area of 29.8 square miles (77.3 km²), of which, 27.6 square miles (71.4 km²) of it is land and 2.3 square miles (5.9 km²) of it (7.61%) is water. As of the census of 2000, there were 34,764 people, 12,379 households, and 9,754 families residing in the township. The population density was 1,261.1 per square mile (486.9/km²). There were 12,924 housing units at an average density of 468.8 per square mile (181.0/km²). The racial makeup of the township was 96.73% White, 0.50% African American, 0.19% Native American, 1.31% Asian, 0.01% Pacific Islander, 0.32% from other races, and 0.95% from two or more races. Hispanic or Latino of any race were 1.16% of the population. There were 12,379 households out of which 42.4% had children under the age of 18 living with them, 68.4% were married couples living together, 7.3% had a female householder with no husband present, and 21.2% were non-families. 17.0% of all households were made up of individuals and 4.3% had someone living alone who was 65 years of age or older. The average household size was 2.81 and the average family size was 3.19. In the township the population was spread out with 29.5% under the age of 18, 5.6% from 18 to 24, 34.1% from 25 to 44, 23.7% from 45 to 64, and 7.1% who were 65 years of age or older. The median age was 36 years. For every 100 females there were 101.4 males. For every 100 females age 18 and over, there were 99.0 males. The median income for a household in the township was $72,702, and the median income for a family was $79,976. Males had a median income of $61,087 versus $36,125 for females. The per capita income for the township was $33,104. About 2.4% of families and 3.4% of the population were below the poverty line, including 3.8% of those under age 18 and 4.4% of those age 65 or over. This page uses content from the English language Wikipedia. The original content was at Commerce Township, Michigan. The list of authors can be seen in the page history. As with this Familypedia wiki, the content of Wikipedia is available under the Creative Commons License.